As indicated in my last blog post, here is an example implementing a small Apache Camel example. The Application should compile and start up correctly. What do you think, how many lines of Java code does it take? Getting started with Apache Camel is simple. I recommend using m2Eclipse which is a Maven plugin for Eclipse. 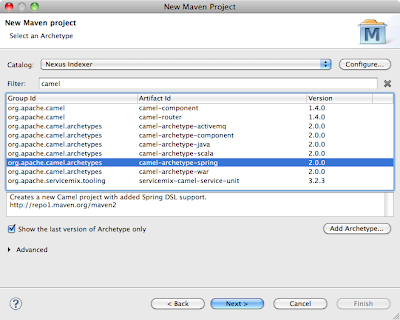 Basically Camel provides it's own Maven archetype which after running creates a simple project structure and which can be immediately run using mvn camel:run after project creation. For my implementation I followed Camel's tutorial for creating a Spring based Camel route. As my example uses a few more components for Apache Camel but also ActiveMQ for JMS and Apache Mina FTP Server, I needed some additional Maven dependencies. Getting all the Maven dependencies right took actually longer than implementing the actual application logic. Anyway, I hope this gives you a quick overview of some basic Apache Camel features. As time permits I will blog about more about it soon. See you then! PS: Apache Mina FtpServer, is itself a nice little nifty package. So if you for example have the need to boot-up dynamically FTP servers from within your application...check it out. I have added link to your blogs on the Camel articles webpage. I hope you do not mind. I do think that the Main class could be omitted as you can start using the camel:run maven plugin, or many also starts using jetty:run. And the FTP server couple possibly be started using some spring bean ninja. But anyway really cool that 0 lines of Java code can do all that. Very nice tutorial... I also had to change the Main class name in the pom file but other than that very nice work. Neat example, and thanks for providing an SVN repo for the example source. I did a checkout and ran the example. Very neat. Your example was really helpful form me!